Simplified Technology Pte Ltd is an independent vendor and solution based service provider, providing various types of commercial solutions, including: self-service kiosk, touchscreen & LCD Solutions, data networking, software development and Point of Sales Systems. 1. Digital signage for education, business, retail and public areas? There are dozens of notice boards on walls throughout schools and colleges. Many of these are used for displaying timetables, results, displays of students work and giving information on events, etc. In shops and public areas, such as libraries, museums, restaurants, hospitals and airports, there too you will see notice boards and posters all giving information or advertising services. A traditional poster is either a printed A4 or A3 piece of paper which has been produced from programmes such as Microsoft Word, Microsoft Publisher or any of the other word processing or desktop publishing packages. When the information on the printed poster needs changing, you then need to change the information in the software package, reprint and physically swap the posters on the notice board. Digital signage is about using small and large computer screens to display still and moving posters which have different information scheduled at varying times and can be updated from a computer somewhere in the building. A typical set up is a 42" plasma or LCD screen connected to a computer (which could be a mini PC on the back or a screen cabled to a PC base unit somewhere else) plus some digital signage software. A classic example would be a screen in a school reception area. This can be used to display information on school events such as sports day, drama productions, after school clubs, parent evenings, etc. on part of the screen, and possibly examples of student artwork on another part of the screen. Scheduling on the screen could be used to display different information at various times of the day. An example would be events information to parents in the morning bringing children to school. This could change to information to pupils mid morning, display of a canteen menu to students and teachers at lunchtime, student artwork displays in the afternoon and more information to parents collecting children at school leaving time. When the information on the screens needs updating, this can be done from another computer on the school's computer network. This will typically be done from the school's reception or admin office, where new presentations/posters and schedules can be designed and sent to the computer attached to the screen in the reception area. Other areas where digital signage screens could be used would be in student and teachers' common rooms and even weather-proof (and vandal-proof) screens on the outside of buildings for displaying up-to-the minute information to students and parents in the school grounds. In a business reception area, products and services can be advertised, and when important visitors arrive, they can be greeted by a 'Welcome Mr Smith', message scrolling along the bottom of a plasma/LCD screen. Within the retail sector, digital signage can be projected onto large screens in a food court where thousands of people sit, eat and relax during their shopping trip. 2. Why not just use PowerPoint instead? Many schools and businesses use PowerPoint on their PC’s for creating presentations to display on screens. Microsoft PowerPoint does an excellent job of allowing you to design and display presentations. PowerPoint is presentation graphics software and is one of the best presentation graphics packages available. Digital signage software is different to presentation graphics software. Understanding the difference will allow you to decide whether PowerPoint, or another presentation graphics package, is a better option than digital signage software. - Scheduling on an hourly, daily or weekly basis what is displayed on screen. - Update of screen information over the local network or over the Internet. PowerPoint needs the presentation changing and then you have to set it playing again. - Some digital signage packages allow any application to 'print' to screens. - Generally, support for RSS news feeds, for example, to display news from the BBC website, and live video sources such as webcams. - Some digital signage systems allow dual monitor support for displaying different presentations on separate screens or displaying a single presentation that spans both screens. - Very easy to use and many people are already familiar with this software package. 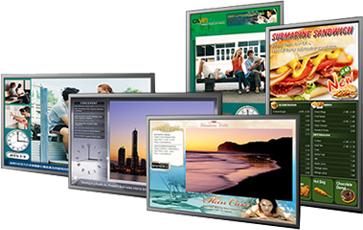 - Large number of effects and transitions between slides, which are generally not seen in digital signage packages. - Is already in use every day in education establishments and many businesses. - Licences may already have been bought and PowerPoint is available for around £100+VAT in the UK, compared to professional digital signage software that can range from £150 to over £1,000 +VAT. - Supports a huge variety of audio/video formats, PDF documents, Microsoft Office documents, etc, some of which are not supported in all digital signage software. We have already mentioned the use of 42" plasma and LCD monitors for displaying information. However, you can use any spare computer screen you have around such as 15" or 18" LCD monitors or even an old projector which may have been replaced by a newer model. Projectors, LCD monitors and plasma screens can all be used to display presentations created on digital signage packages or PowerPoint. Projectors have the advantage of allowing large images to be displayed at a low cost. However, don't forget to take into consideration the lamp life of projectors. If you are displaying digital signage with projectors in school hours, then the displays could be on for over 40 hours per week. If you are using your projector for display in a shop or public area it could be on for up to 24 hours a day. Some projector manufacturers' have models in their range designed specifically for 24/7 application. Casio, for example uses an LED-laser light source which lasts up to 20,000 hours with no replacement lamp costs. Many of the new LCD and plasma TV's that you see in Argos and other high street stores are now very cheap. However, you need to be aware that these are designed for consumers watching television around 4 hours per day and are not designed for digital signage. Professional screens are better constructed, have better manufacturer warranties and some are designed to be left on all day, whilst others are designed for 24/7 usage. Should you use domestic screens for commercial applications, depending on manufacturer, you could even negate the warranty. Some digital signage packages are designed for use with touch screens. Most shopping centres and airports now have kiosks with built in touch screens that that allow the user to find information or directions. Digital signage is also known as narrowcasting in advertising circles. In many UK Post Offices you will now see digital signage screens displaying adverts for both local and national businesses. These are installed and maintained by advertising companies who charge these businesses for displaying their adverts to Post Office customers. A local business could, for example, have its own commercial LCD screen to advertise its products and services and generate revenue by advertising other local businesses as well, perhaps with non-competing products and services to the same type of customer. An example of this would be an estate agent advertising the services of painters and decorators, house removal firms, etc. In the education sector, potentially there is room for schools and colleges to either advertise paid for courses (especially for night school) or even to generate revenue from local businesses advertising beneficial services to students and parents. An example would be local piano teachers advertising lessons or local fitness instructors advertising aerobic classes. 6. What you need for your digital signage presentations? OR, a solution that combines two or more of these components, for example, a media player with pre-loaded digital signage software, an LCD monitor with built-in PC, or an LCD monitor with built-in PC and digital signage software. 7. Presentation graphics software packages? The following packages allow you to design and play presentations and are either free or low cost. However, none of these do scheduling, so whatever presentation you play, it will keep playing in a loop until you stop the presentation, change it and play it again. PowerPoint costs around £119+VAT in the UK and you need one copy (licence) per PC. You can insert text, pictures, movie clips (video) and sound. If you want to show a PowerPoint slideshow on several LCD screens, you could use a splitter box and output the slideshow to say four LCD screens around the school or business. The disadvantage of this is that you can only show the same presentation slideshow to each of the four screens. Otherwise, you would need to buy four PowerPoint software licences to use on four PCs in order for each one to output a different slideshow presentation to each of the four screens. OpenOffice.org lets you download a free copy of Impress, which is a tool to create effective multimedia presentations. You can also download their word processor, spreadsheet, database and other software packages free. Using Impress, you can also create Flash versions of your presentations. In the illustration above, we created a single slide and brought in a graphic and then inserted text. We could have created a number of slides showing still images and text and then run this as a slideshow. You can also insert animated images, video, charts, spreadsheets and audio (music). You can install Impress on any number of PCs, free of any licence fees and use it for any purpose, private, educational, government, public administration, commercial, etc. This means you can create your presentation on any number of PCs and output to display screens, all without any licence issues. Using Windows Movie Maker to create a storyboard presentationn Windows Movie Maker, which comes with free Windows, allows you to import video, pictures or audio. You can add a title, credits and effects and, once finished, you can save to your PC or onto a CD, send to the Web or digital video camera. From your PC you can play your movie presentation, either through a projector onto a projector screen or onto a plasma or LCD display screen. When you open a copy of Windows Movie Maker, you first bring in media such as a video, a picture from your computer or from your digital camera. Each insert is previewed in the right hand screen, as shown above. You then drag and drop each one into the storyboard, which runs along the bottom of the software. Audio can be brought in to add music to your storyboard presentation. Once your storyboard is finished, you can then create effects to your images. These include blur, fade out to white, mirror vertical, spin 360, etc. You can also create transitions on your storyboard between one type of media and another. These include diagonal, rectangle, dissolve, cross out, heart shape, etc. When you have finished, you can play your storyboard presentation and if you have selected a transition such as diamond, for example, as the storyboard moves from one picture or video to another, it appears in a diamond shape, opening up to a rectangle. Once you are happy with the finished result, you can publish to your computer, a recordable CD, email, or transfer to a digital video camera. Please note that the version of Windows Movie Maker is different on Windows XP, Vista and Windows 7. The XP and Vista versions are limited as they will not output HD video resolutions. Windows 7 allows you to make your movie in standard 4:3 aspect ratio or widescreen 16:9. You can select the resolution of your movie depending on where you want to upload to, for example, they recommend a maximum 1280x720 for uploading to Flickr or Facebook, and a maximum of 1920x1080 (HD) to YouTube. Once you have created your presentation (message), you save it. This can then be broadcast (played) onto a display screen or through a projector through your local area network (LAN). Each digital signage software package is different, although many have common features. Most offer a 30 day free trial. Depending on the digital signage software, some software packages have schedulers, which allow you to specify what time, and on which day of the week you want a specific message to be displayed. For example, in a florists shop, your design could show a selection of the flowers and plants you sell, with scrolling text to give a message and/or website address and telephone number. You could design another page which shows, for example, wedding flowers, which is saved as 'wedding_flowers'. You can schedule this presentation to be played through a projector onto a rear projection panel suspended in the shop window, for example between 12-1pm every day, and then it reverts back to its normal on-going playlist. Another example would be in a school. You could design a page which tells parents there is a PTA meeting on Friday evening, which is saved as 'PTA_meeting'. You schedule this to be played on the widescreen LCD monitor in reception area at 3.15 pm daily for 30 minutes, so that parents will see this when collecting pupils. After it has played, it then reverts back to its normal on-going playlist. There will be common components within each digital software package on the market, such as a design manager or create new presentation option, which allows you to design your message, a play list or scheduler, which lets you decide in which order you want your message to be played. Where a software publisher offers, for example, entry level software and professional software, the entry level will often be a cut down version of the professional edition, and it's no use paying for features you are unlikely to need for your applications. Obviously, you need to check before making a purchase that the digital signage software includes all the features you need. An entertainments manager of a leisure complex, for example, is responsible for advertising forthcoming events using digital signage software. He selects a software package having checked he can use the media he wants to work with, still images, video clips, scrolling banner (text) advertising daily events. It's his day off on Tuesdays and he needs to advertise the day's programme of events from 9am in the morning, which changes hourly. Software with 24 hour scheduling means he has to delegate the task on Tuesdays or come in on his day off (not a popular option). Weekly scheduling lets the software work for him and not the other way round. A store owner has ten stores scattered across the UK, wants to control the digital signage content being displayed on the widescreen LCD monitors, from his office. Using professional digital signage software that includes a scheduler and which updates information over a wide area network (WAN), he can achieve this. Many digital signage software publishers offer standard and professional versions of their software. Digital signage software packages which are available for digital download or from a CD, are often referred to as 'stand alone packages'. This means you design your presentation on your own PC and then play it using a dedicated PC or media player onto a plasma screen, LCD display or through a projector onto a projection screen. Trying to play your presentation on your own PC to a display screen is not practical, especially, if you are using digital software that uses up chunks of your PC's memory. It could be that you have old PC's lying around which do not have sufficient memory for your everyday needs but which do have enough to run your digital signage presentation. There are also digital signage media players on the market, which are basically small PC's. Some LCD displays have built-in PC's. The picture above left shows content produced using Public Area Display System (PADS) entry level, stand alone digital signage software. The centre picture shows how the content changed a minute later, to show different text and an image, all using the same software template. The picture on the right shows their player with pre-installed PADS digital signage software, or you can buy the software on its own. In the example above, a logo (image), text, graphic, real-time clock and animated graphic have been inserted. To enable the word 'Corporate' to then change to 'Government' you add your text to a play list, and specify how long you want each word to appear for. A play list for images is used in the example to the left of the clock, where you view the first image for a say 5 seconds, which is then replaced by the second image, and so on. PADS is available as PADS Standalone digital signage software for single displays or PADS Professional digital signage software for a networked environment. Digital signage software packages let you create your presentation using pictures, animated gifs, text, Rich Text Format, PDF, real-time date and clocks, video, webcam, web browser and RSS feeds. There are many digital signage software products on the market but we found that most required the use of restrictive templates. Their templates were either non-widescreen or widescreen and then just stretched videos and pictures depending on the screen they were being displayed on. Repeat Signage is different. You design the presentation for the resolution of your screen. For example, you may want to display information in your reception area on a widescreen LCD monitor which has 1365x768 pixels. Repeat Signage lets you design for these screens in full screen mode allowing you to place any number of pictures, text, scrolling text, videos, PDF files, website pages, web browsers, real-time date and clock, etc., exactly where you want them, pixel for pixel. It is important to check licences when purchasing digital signage software, as these vary depending on the software publisher. As a rule of thumb, if you install the software on one computer and show the same presentation across multiple screens, you normally only need the one licence. However, if you want to display different presentations on four screens, you will need to use four computers or media players and will need four licences. Some software publishers have site licences, but these are normally limited to educational sites. 9. Media players with pre-installed digital signage software? There are many media players on the market that can be used to play your presentation to an LCD monitor, plasma screen or projector with a projector screen. Some come with pre-installed digital signage software, which means you design your presentation on the software and then play your presentation directly from the media player onto your display screen. Optoma SignShow D5000 has variable resolution outputs from 480p right up to 1080p (Full HD) which allows it to be connected to any display device. The D5000 can display any layout from a single media zone up to a maximum of 8 simultaneously for larger displays. The media content can be a combination of live video (streaming), still images (pictures) and message tickers (text messages), background image, date and/or time, weather, audio and database feeds. The program creator software offers a user friendly programming experience with no associated ongoing running costs. The software is installed on your local PC as opposed to a remote server. Therefore, all content is secure and easily accessible. The software allows users to easily design, review, publish and manage the signage message. When your presentation (signage message) has been designed, it is uploaded to the digital signage processor (media player), using a USB memory or via your network. The player is very flexible when it comes to installation as it can be setup as a standalone or fully networkable signage solution. The compact design of the D5000 is ideal for installations that are trying to stay away from a full rack infrastructure. The Optoma D5000 has proven to be effective into all education environments as it is flexible, intuitive, user-friendly and affordable with no ongoing cost of ownership. Cayin PRO series of digital signage players supports a background design, one multimedia (stored HD video/streaming video/image/music) area, two image slide show areas, one ticker area, and one clock and date area. Except for the clock area, each zone can be scheduled separately, providing you with the best flexibility to arrange your presentation. The series include players that allow 6 or 7 zones into which you bring your content, e.g. an image (into one zone). CAYIN Technology provides dynamic digital signage solutions, including media players, servers, and software, specifically designed for the out of home (OOH) digital media network. Interactive digital signage, integration with touch screen and mobile devices. can keep customers involved. CAYIN's SMP-WEB series media players support integrating with HID compliant touch panels, widening selection and hastening the deployment of interactive public display networks. Integration with mobile devices, such as iPhone, also receives much attention for its convenience and interaction, such as switching digital signage content easily by a single touch on a mobile phone. SMP-WEB series digital signage player can integrate with one large touch screen and serve as an interactive information stand in public spaces, such as shopping mall, train station, etc. a touch screen as shown in the left hand picture above. In the centre picture, this shows how you can use the smaller touch screen to control the content showing on the large screen. In this example application, you would need to use two SMP-WEB series digital signage players. In the right hand picture, this illustrates that when users tap on the touch screen on their mobile phones, an HTTP command will be triggered from your mobile phone that controls the corresponding content showing on another display. It's a matter of personal choice and application as to whether you want a web based solution or stand alone software on your own PC. As technology advances, and software and players are continually being upgraded, it is not feasible to cover every make and model in this guide, there are simply too many digital software packages, players, media servers and all-in-one solutions out there, for us to cover everything. When you visit public environments such as airports and shopping malls, you are likely to see information and advertisements displayed on plasma screens or large widescreen LCD monitors. Information can also be projected onto large screens or windows. However, before we compare the various options, it's important to note that all the displays in this section are commercial displays designed for public areas. Commercial plasma screens and LCD screens do not come with TV tuners and normally do not come with speakers, although some offer speakers as an optional extra. Some manufacturers displays are designed for 24/7 applications and some can be used for both landscape or portrait mode. With TV-TOOLS software and GM-F Series large format displays, JVC Professional can offer targeted digital signage solutions. TV-TOOLS is a powerful digital signage, content management and distribution tool, allowing users to display whatever media and information they need, including DVD, PowerPoint, Flash files and video content. After creating content in the easy-to-use designer software, this can be distributed via an IP connection (LAN, Internet, FTP) to any number of displays via compact PCs. You can communicate your sales campaigns and promotions with minimal administration costs to get your message heard. JVC Professional's GM-F screens have a number of clever features, including a PIR sensor to allow content to change dynamically as people approach, or to power down the screen if there's no one in the room, making it an environmentally-sound solution. They are full-HD displays, with excellent colour reproduction and contrast, and are designed for 24/7 use. The designer software in TV-TOOLS allows you to work without any limits in the range of content you can create on your PC. There is a flexible choice of content type; including video, still images, flash animations, RSS feeds and websites. It also features dynamic integration of product or price information through use of SQL databases. Management of all players and around the clock play-out is made possible by the scheduler software. Scheduling can be completed months in advance and the user has full control of display screens and background music. The flexibility of the TV-TOOLS software, compact PCs and GM-F displays makes this a very versatile digital signage solution. LG's wide display Flatron LCD monitors are designed for public information display. They are currently available from 42-inch up to 65-inch. They can easily be mounted on walls, ceilings or desktops, and are used in public areas such as, airports, stock exchange, motor shows and hospitals. For professional digital signage application, LG SuperSign digital signage media player and software is designed to be used with their commercial LCD screens. Once your digital signage message has been designed you connect the media player to multiple screen options to transmit your content such as way finding, dynamic advertising, information boards and broadcast video in full HD (high definition). LG have large format LCD displays that are stretched with a wide aspect ratio and these are ideal for displaying two separate contents. The concept is for these stretched displays to replace the conventional LCD display where space is at a premium. Ideal for call centres, casinos and bus terminals. Luminis have a 3D enabled signage player with software and a range of 3D stereoscopic enabled screens in sizes 22" to 57" (diagonal inch). These LCD screens use lenticular screen technology which means glasses-free 3D. This is essential of course for digital signage in public areas, where there is no chance to hand-out free spectacles to every student or passer-by. Once you have produced your digital signage presentation using either 2D or 3D content, you can play it onto the 3D enabled screen, which can be viewed without using any special glasses. Obviously, you will only be able to view in 3D if you use 3D content. Luminis also produce a 2D all-in-one digital signage solution comprising a media player and signage software that supports Windows media file formats to create your own on-screen messages. Mitsubishi MDT series of 42", 52" and 65" LCD monitors are highly functional, durable, public displays for commercial applications. They have slim and ergonomic front appearance, with simple back design that easily integrates into walls, are Full HD and can be used landscape or portrait for 24/7 applications. The Mitsubishi MDT 52" LCD screen can be landscape, portrait or face-up. Mitsubishi have seen a number of different uses for these screens mounted face up. These included screens used in tables face up with interactivity. Another example was in a shopping centre that wanted to make a path out of LCD screens. Obviously, in this scenario, the screens needed protective covers and Mitsubishi adjusted the fans to run constant instead of when they reached a certain temperature. You must operate the internal cooling fan full time when a panel is used in a face up installation. Face down/upside down installation is not supported. The 65" has LAN-based control that can be controlled remotely via an Ethernet LAN. You use the daisy chain connection function of the CAT5 receiver and output terminal to link up to five displays in the series via CAT5 cables. What this basically means is that you use the CAT5 receiver to daisy chain one screen to the next, so the cable comes out of the first screen through the output and into the next screen, then out of that one into the next one. So when you show your digital signage presentation, it's picked up on all the screens. Mitsubishi also have the LDT series of LCD screens in sizes 32", 42" and 46", which can also be used in landscape or portrait mode. Bezels are broader than in the MDT series, and the latter two sizes are Full HD. Schools and colleges must communicate a large number of messages simultaneously to a widely diverse audience including current and prospective students, teachers and visitors. Embracing digital signage enables way-finding messages, class notices and timetables, class changes, emergency bulletins and event promotions to be communicated in a clear and concise way whilst demonstrating a progressive technology-led environment to strengthen your school branding and PR. The benefits are multitude and best of all delivers a cost saving - both to your budget and to the environment. NEC offers a comprehensive portfolio of digital signage solutions ensuring a low Total Cost of Ownership backed by a robust warranty and support process. 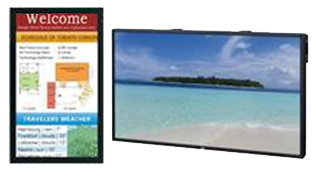 NEC MultiSync® V-series including DST Touch are entry level public displays ideal for education establishments making their first move toward digital signage. The V-series models, comprising 32", 42" and 46" sizes, come equipped with a high-quality S-PVA panel and offer pioneering control options via LAN in addition to RS232. An HDMI interface also ensures outstanding multimedia connectivity. NEC offer novice-friendly digital signage software free to download for creating and displaying informative content. NEC MultiSync® Multeos series including DST Touch, comprises 40", 46" and 52" models delivering a 1920 x 1080 Full High-Definition image, easy-to-use configuration and connectivity options and a strong aesthetic appearance. The NEC Option Slot for expansion modules offers a very flexible solution. NEC also has speciality public displays with their X-series, such as their MultiSync® X431BT, 43" bar-type panel. This model is ideal for unconventional applications especially where space is limited. They also have a high brightness large format display which is designed for outdoor applications and environments that have bright ambient light, for example positioned on the inside of a store window. For commercial retail applications, NEC have a range of large format displays for video walls. You can create immense video matrixes, with arrays as large as 10x10 whilst bezels can be virtually invisible starting as thin as 2.7mm. Flexible options with simple paired or 4 panel solutions are ideal for reception halls and public spaces, right up to mega walls for events and situations where presence is everything. You can utilise their Daisy Chain Option Board to set up large arrays of screens, simply and cost-effectively. Optoma's reputation for providing reliable high specification products at an affordable price continues with the introduction of 15", 19" and 22" active matrix TFT LCD public display panels to their ever increasing digital signage portfolio. The screens can be used as a generic panel or full interactive (touch capable). All screens work in perfect harmony with the D5000 or any other third party digital signage playback device as they accept both digital and/or analogue input signals. There are two alternative options available for each screen size: Generic display or Interactive display to suit almost every digital signage requirement. Optoma screens have been designed specifically with the intended application in mind and as such, operate easily under very harsh conditions including 24 hours a day, 7 days a week, 365 days a year. They have reinforced glass surface housed in a slim and ergonomic housing to accommodate installation in either portrait or landscape layouts. With resolutions up to 1680x1050 (depending on models), these are robust and highly durable commercial grade digital signage display panels at consumer prices backed with a full 2 year (RTB) manufacturer warranty. Panasonic manufacture plasma screens for public display applications. Currently their largest plasma is 103" diagonal, which has been installed in many areas, such as shopping centres, broadcast studios and for rental applications. Panasonic have a slot in PC option with their professional plasma screens, which is a powerful tool for digital signage. They have excellent flexibility in their screens with 3 slots and various boards, including the slot in PC, wireless board, CAT5 board, etc. Panasonic plasma screens have menu features that decrease the likelihood of screen burn. The "wobbling" feature will move an image slightly, so that it is not static, whilst "white bar scroll" is where a vertical white bar scrolls across the screen to "refresh" it. Panasonic have plasma screens in T1 at London Heathrow Airport, which have been installed for years, with no screen burn. They say with plasma there are ways to go back, i.e. wobbling, white scroll bar, image reversal, but with LCD's there is no way back. Other key features of their professional plasmas are Advanced Picture In Picture modes (PIP), Weekly Command timer mode and landscape or portrait mode installation. Panasonic also offer a touchscreen solution using a plasma screen and touch panel overlay. They also have anti-glare panels, which can be fitted to professional plasma screens. Philips range of professional LCD displays include models for public signage solutions. These include LCD models with slim bezels and ultra slim bezels, the latter being ideal for video walls. Designed for professional 24/7 installations, Philips LCD's can be used in portrait or landscape mode. Philips manufacturer a variety of AV products including LCD displays, but do not produce digital signage software. Samsung make widescreen LCD & LED monitors, some of which include a built in PC with MagicInfo Pro digital signage software or web-based MagicInfo i software. MagicInfo Pro uses an Ethernet network for servers and monitors, and transfers media files (image files, music files, and movies) and office files (HTML, PDF) from the server to the monitors over the network. Multiple monitors are connected to a server via a network and the server can transfer files to all the monitors at the same time or a single file to a single monitor. There are two ways to transfer files. The first is that the server registers a schedule to the monitors and then transfers files following that schedule. The second is that a monitor searches for the files registered in the library list of the server and receives and plays them. If more than one server is connected, the monitor can select a server and can receive a schedule from it. The monitor has a built-in Internet connection function. The servers and monitors are connected to the network. Each server or monitor has a unique name to identify itself on the network. A server and a monitor can only be connected if they have the same server name. For example, if the name of a server is 'MagicInfo Pro', only the monitors whose server name is 'MagicInfo Pro' can receive schedules from it. If a monitor cannot find a server whose name is the same as the server name configured in it, it waits until a server with that name appears. However, if Auto Connection is enabled, the monitor attempts to connect to other servers and connects to the first server that responds. The MagicInfo-i Server is a web-based management tool that manages content and devices and organizes and publishes content. A user can connect to the server and control devices remotely and organize content with various effects using their web browser. You can arrange various objects such as, Graphic, text video, animation, clock, logo, and RSS, and generate effective presentations and interactive contents by using MagicInfo i. A user can connect to the server and control devices remotely and organize content with various effects using their web browser. A Server manages generated contents for easy reusing, searching, and distributing. Centralized creation and distribution system makes various types of display management simple. A Player can be applied to various display. For example, it can produce interactive contents by applying all Samsung Network display. Let's imagine you have your corporate headquarters in the UK, and your organisation has opened a chain of retail outlets across the USA. You want to control what content is seen in-store, without having to get on a plane to see individual store managers to delegate controlling on-screen displays. From one PC you can control content, so when store A and B opens at 9.00 western USA time, customers see specific content, which is shown in store C at 09.00 eastern USA time. Alternatively, you may wish to display traffic and weather information in store A, whilst store B shows suggested menu servings, and store C shows highlights from a sporting event. As you open more stores, you simply need to purchase additional Samsung displays with MagicInfo I and ensure you have the required minimum system recommendations as per the manufacturer's specification sheet. Sharp specialise both with their Aquos LCD TV range, as well as large format displays for commercial applications. Sizes of their PN-E range of from 42" to 60" diagonal, with slim bezels, built-in speakers, full HD (1920x1080), designed landscape or portrait for 24/7 public display applications. Sharp also has a full HD 108" diagonal LCD monitor of robust design and 24/7 operation enabled. An optional screenlifter is available to lift this heavy screen up to 3 metres into the air at the touch of a button. Sharp use third party digital signage software and partner with three digital signage software companies. This is so they can recommend a different package to suit various applications, such as AMX Inspired Signage software for dynamic signage, Dynamite Digital for use by advertising companies and Nexus for use with interactive touch screens. Sony BRAVIA B2B range includes the KDL-X500P series. These are entry level, Full HD LCD screens in sizes 32", 40", 46" and 55" and are designed for digital signage and public display applications. They are ideal for professional use in educational installations and come with a Sony 3 year warranty. They have a wide viewing angle so that the screen image will be visible in full quality from the side as well as from the front of the screen. This BRAVIA has HDMI, Component and PC inputs for easy connection to computer-based players, DVD and Blu-Ray players and many older systems. You can play media from a USB memory stick, straight into the screen itself. This is a simple way to use the screen for product presentations and picture shows. RS232 is the standard remote control interface for digital signage applications. 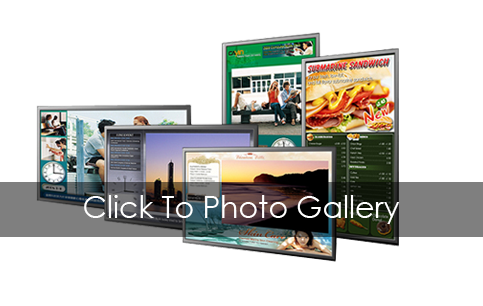 ViewSonic is a display technology company that provides complete digital signage solutions. They have display screens from 10" to 300" for a range of applications. They have a variety of options from network media players to ruggedized, energy efficient PC solutions. ViewSonic's Signage Manager Express Software enables expert control of digital media content with ease. They also recommend a digital media player that is compatible with the digital signage software. As an example for the hospitality and leisure market, ViewSonic 42", 46" or 52" thin bezel displays produce a video wall for entertainment and advertising. The digital signage is produced by their software and recommended media player for a complete solution. Designed for use in public display areas as well as meeting room scheduling, digital signage can communicate with guests by displaying valuable information about events or directions as well as provide entertainment. A ViewSonic solution can be used across several different geographically dispersed locations for consistent messaging and strong corporate branding. You can create hotel property specific messages and manage it from a single location. Centralized control is easy and does not require individual onsite management with their network addressable media players and content delivery solutions. Other areas that ViewSonic digital signage solutions can be used are travel and transport, retail for point of sale information, large college campus and for corporate communications. ViewSonic offers a choice of software to best suit your needs; ViewSonic Signage Manager Express; BestWave software and FriendlyWay composer software. Although correct at the time of writing, technology changes frequently, so this is intended as a guideline only. 11. Rigid projection panels and projection film? Once you have designed your digital signage content, you can output it through your dedicated PC or media player to a plasma screen or LCD screen, or you can output to a projector to shine onto a large projection screen. The projection screen could be a rigid front projection panel, a rigid rear projection panel made from acrylic, or it could be through window rear projection film or front projection film for application onto glass or acrylic. Let's look at some examples. You may want to position a screen onto a wall, for example above an escalator, so that customers can view information whilst travelling from one floor to another. In the picture above, rear projection (where the projector shines onto the rear of the screen) isn't an option. The MirrorVu (dual front/rear projection) screen is such, that when the projector is switched off, instead of customers seeing a blank panel, they see a mirror effect. This is not the same as seeing your reflection in a proper mirror, but rather a silvery mirror effect. Assuming you want as big a screen as you can possibly afford to display your message, let's do some maths. Four 42" public display plasma screens or LCD screens will cost you around £2,600+VAT (£650+VAT each) and four 52" screens are around £7,780+VAT (£1945+VAT each). You can buy a projector from £295 upwards, and a rigid rear projection panel 60" diagonal for around £650+VAT. Jump up to a 152" diagonal panel and you pay around £970+VAT. Obviously the larger your rear projection panel, the brighter projector you will need, so to get one that is designed for high end 24/7 usage and you could pay from £1,600+VAT upwards of £5,000+VAT. You would also need either ceiling to floor mounts, suspended ceiling mount which is up to around £175+VAT depending on the size needed. Alternatively, a display stand to position the screen at point of sale. Now before you rush out and buy a projector and rigid front or rear projection panel, you need to work the cost of replacement projector lamps which last around 2,000 hours, compared to the life of a plasma screen or LCD monitor, which could be 20,000 hours upwards, depending on manufacturer and model. Semi-transparent, holographic rear projection film, such as TransVu illustrated above, is 65% transparent and can be used for indoor applications or night time applications on the inside of outdoor windows. When you turn the projector off the window can be seen through and used as normal. This film is ideal for creative projects where there is a design need for eye-catching holographic images. When you want to project images directly onto glass, such as estate agents who advertise property in their windows, or travel agents attracting you with exotic locations, or a department store who want to give customers a 24/7 fashion show, there are window films available on the market. For want of a better description, window film looks like a thicker version of cling film or thick polythene, but is especially made to display a projected image from your PC and rear projector. You normally ceiling mount your projector and then project onto the window film screen. Some rear projection screen manufacturers recommend you project at a certain angle, to get the optimum viewing angle. So do check manufacturer specification sheets before making any choices. Depending on factors such as north or south facing windows, size of windows and type of window film used, and whether the images are viewed during the day, or only at night when the premises are closed, or 24/7, it is also important to choose the correct projector for the job. Like the rigid (acrylic) projection panels, window film is available in wide angle, high brightness or superb contrast options. For example, a shop which has four large windows, two either side of the entrance door, may want to use wide angle window film on the two windows furthest away from the door, as these are viewed by passers-by. High brightness window film screens may be used for the windows nearest the door, so that customers entering the store can see them, and therefore wide angle viewing is not needed. You would then mount ceiling mount projectors behind the window film screens. Most projectors let you switch from front to rear projector at the click of a button, so that the image is reversed. Then when it's shone onto a rear projection window film screen, you can see the image the right way round. Again, it is advisable to check manufacturer specification sheets before making your choice. It is advisable to have the film applied by professionals who know what they are doing, otherwise it's easy to ruin the film and damaged screens cannot be replaced. It makes sense then, to spend a few hundred pounds extra, to have your window film applied correctly, rather than have to buy replacement films. You can buy on-glass window film in various sizes, 50" and 60" diagonal being popular sizes. Or you can buy window film per square metre to fit your application, or custom made to almost any shape or size. As well as being able to display your message on shop or office windows to your customers, you may wish to engage them by having an interactive window. Adding touch facility, allows passers-by to touch the window screen and browse properties, for instance, request further information or even register their interest in viewing a house. All whilst the office or store is closed. Depending on manufacturer, you can buy on-glass window film in standard or custom sizes, and then have an interactive foil applied on top, or you can buy an on-glass interactive touchscreen which comprises both elements together. You will also need a projector for shining onto the rear of your interactive touchscreen, and perhaps digital signage software. Again, it is advisable to use professional installers who know what they are doing. It is important to check that the digital signage software you intend to use supports touch screens, as not all do. with in-built digital signage software You have probably seen the many interactive kiosks springing up all over the place, in shopping centres, banks and airports. They can be used for way-finding, browsing which stores are in a shopping mall, or for requesting information. Some touchscreen kiosks even allow for your corporate logo to appear on the kiosk itself. A kiosk may have an in-built PC from which you can you can run your message. The LCD all-in-one touchscreen, illustrated above, includes LCD screen, in-built PC and digital signage software. Touch screen overlay for plasma or LCD screens You can buy touchscreen LCD monitors. However, if you already have plasma screens or large format LCD monitors and you want interactivity, then touchscreen overlays are available on the market. A touchscreen overlay fits over your existing screen to give it touch interactivity. It is important to check the overlay specification before purchase, to ensure if fits your make and model of screen. Also import is to check that the digital signage software you intend to use supports touch screens, as not all do. 14. Digital signage display mounts? Pasma screen and LCD monitor manufacturers may offer the option of using their own brand of mounts for their screens. However, these tend to be more expensive than brackets that you can buy from specialist bracket manufacturers. Large screens, whether plasma screens or widescreen LCD monitors, can be mounted singularly from the ceiling, back-to-back from the ceiling, back-to-back at intervals such as when people are walking to airport gates, or wall mounted in a horizontal line, as shown left to right in the pictures above. Large screens can be installed into video walls, in several combinations, such as six LCD screens in an airport, above left, each screen mounted separately at intervals in a horizontal row, such as for advertising meals in restaurants, or a large video wall of twenty LCD screens, as shown above right. Theft or tampering with LCD and plasma screens is a problem, especially when used in public areas that cannot be continually supervised. Manufacturers such as Unicol, make a huge range of universal and bespoke brackets to fit all kinds of screen applications including video walls. Multiple desktop LCD monitors can be mounted on desk stands, either freestanding, desk clamp or with a bolt through the desk. Multiple monitor pole mounts and floor stands are also available. Manufacturers such as Ergomounts, specialise in screen mounts for single and multiple monitors of all sizes. 15. Quick guide to basic digital signage and touchscreen software? The majority of schools use PowerPoint for pupil presentations. As teachers are familiar with the software, it is fairly simple to create a PowerPoint presentation, which could be displayed on plasma screens or large LCD monitors in the reception area for visitor information. Below are quick guides to creating a PowerPoint presentation, creating touchscreen using PowerPoint and creating a movie clip using Windows Movie Maker. Trying out a prototype of your presentation will give you an idea of what features you're likely to need, before making any purchases. 16. Creating a digital signage presentation with PowerPoint 2003 / 2007 / 2010? This was originally created on the 2003 version of PowerPoint, as per the instructions below. It may differ for other versions. For this edition of our digital signage guide, we retested creating a digital signage presentation with PowerPoint 2010 on a Windows 7 computer. We have listed the differences in brackets for you. You can download a free trial of MicroSoft Office Professional 2010 from www.microsoft.com which includes Word, Excel, Outlook, OneNote, Publisher, Access and PowerPoint. Open up PowerPoint and a new page should appear which shows a box which says: 'Click to add title', and a box beneath that, which says: 'Click to add subtitle'. If no page appeared, then go to File and select New, or click on new page icon on the left hand side of the toolbar, which is underneath the File menu. Click into the top 'Click to add title' box and the message disappears, and is replaced by your cursor. Type in some text, for example,' Welcome to our presentation'. Click on the lower box and again the message disappears, and is replaced by your cursor. Type in some text, for example, 'Digital signage'. Save the page by clicking on 'File', then 'Save As'. (PowerPoint 2007 users, click on the round Office button on the top left corner, then 'Save As'). In our example, we'll save as 'presentation.ppt' You need only type 'presentation', as PowerPoint automatically adds the extension .ppt for you. On the menu bar, go to 'Insert' and select 'Picture', and then select 'From file'. This takes you to 'My Pictures' where you can select an image, or, in the 'Look in' box, navigate through your computer files to find an image, then click onto it and click 'Insert'. This brings the image into the box. Your image may have covered most of the page, so can resize it by clicking onto a corner of the image, hold down the shift key, and drag it to make it smaller. If you want to move your heading 'This is my advertisement', higher up the page, then you can do so by clicking the box surrounding your text, and dragging it up the page. Then save your work. You now have two slides. On the menu bar, select 'Slide show', and 'View show'. (Select 'From the beginning' instead, for PowerPoint 2007 and PowerPoint 2010 users). Or you can press F5. The first slide then appears on your screen in full size. Press the 'page down' key on your keyboard, and the second slide with your image appears on screen. Press the Esc. Key to come out of your slideshow. You can have as many slides as wish for your presentation, which will appear down the left hand side. You can click on each one and drag it up or down to place your slides in the order that you wish them played on screen. PowerPoint allows you to insert text, images, movies, charts and tables. You can number your slides, add the date, and add notes to remind you what each slide is about, especially useful if you are giving a talk or presentation. In the 'Slide transition' menu which you access from the 'Slide show' menu, this lets you choose how you want your slides to appear, for example, in a diamond shape. (PowerPoint 2010 users select the 'Transitions' menu and you can choose various effects for how you want your slides to appear, for example, fade, split, reveal, etc.) You can specify how fast or slow you want them appear on screen and for how long, for example, each slide to be on screen for 5 seconds and then automatically move to the next slide, and then loop to the beginning. When you run your slide show it will play either manually or automatically, depending on how you set it up. If you want to view your PowerPoint presentation on a computer that doesn't have PowerPoint installed, you can do so with PowerPoint Viewer, which is free from www.microsoft.com. Just search for 'PowerPoint viewer'. This lefts you run your presentation on a computer without PowerPoint free of charge. 17. Creating a touch screen application with PowerPoint 2007? If you don't have PowerPoint, you can download a 30 day evaluation copy of Microsoft Office 2007 from www.microsoft.com and have a go at producing your own touch screen application. PowerPoint will allow you to produce a presentation with buttons on the slides that allow users to navigate between all the slides you create by clicking on large buttons. If you can get PowerPoint to produce your intended application, then you are only looking at £119+VAT for the 2010 edition, plus you can purchase a 17" touch screen for around £325+VAT. Starting with PowerPoint will, if nothing else, allow you to start prototyping an application and get some idea of how users will interact with it. The limitation is that you can only display information to users and not accept data input. If you attached a keyboard to the system that PowerPoint is running on, rather than just have the left mouse clicks that a touchscreen would allow you to control the system with, then the user could close your presentation and have full access to the computer, which is not what you want. Open PowerPoint which will automatically create a new presentation for you. Now on your keyboard hold down the Ctrl key and the press the S key to save you presentation (Ctrl + S) which will be called 'Touch screen application demo.pptx' and click on 'Save'. Repeat steps 4 and 5 to create a third slide and in 'Click to add title', type 'Services'. Save your work with Ctrl + S on the keyword. Now click on the first slide on the left side, so that the 'Touch screen application demo' slide is displayed. Now click on the bottom right button which when you put you mouse over it says 'Action button: custom'. (PowerPoint 2003 users will have to choose the first button which looks like a square without a picture in the middle). You will see your mouse turn into a + symbol and you need to click your mouse on the slide in the main area to add the button to the slide. Your button will appear on screen and then a box called 'Action settings' will appear. Now repeat steps 8 to 13 to create a second button called 'Services' which you need to link this time to the Services slide. Save your work with Ctrl + S on the keyword. Now add an action button (review steps 8 to 14 if you can't remember how to do this) called 'Home' and link it back to the 'Touch screen application demo' slide. Now click on slide 3 - the Services slide' in the left Slides window and add an action button called 'Home' back to the 'Touch screen application demo' slide. Now click on the 'Slide show' tab at the top of the screen and click on the 'Set up slide show' button (PowerPoint 3 users will see 'Set up slide'.) In the 'Show type' section, click on 'Browsed at kiosk (full screen)' then click on OK. Save your work with Ctrl + S on the keyboard. Now the final stage is to save your presentation ready for viewing. Select 'File' and 'Save As', and from the drop down list choose file type and select Presentation for Review .ppt Give your presentation a name such as: touchscreen_demo.ppt You can transfer your .ppt presentation to be run on another computer, free of charge, as you don't need to have PowerPoint installed. It can be viewed with PowerPoint Viewer, and you can download a free copy of PowerPoint Viewer 2007 from www.microsoft.com (search for PowerPoint Viewer). You can also publish your presentation to a CD, by clicking on the round colourful button in the top left corner of PowerPoint, called the 'Office button' and click on 'Publish' then 'Package for CD'. (PowerPoint 2003 users do not have the 'Publish' option, but they can download PowerPoint Viewer from Microsoft free of charge.) The demonstration above is very basic. You would need to spend time learning PowerPoint to get the best out of this package. An easy thing to do is to collect pictures off the Internet. Find a picture on a website, then right mouse click it and choose 'Save picture as' and save the picture to your hard disk. You can then insert them into your presentations and resize them. When on a slide, a picture can be right mouse clicked and the 'Hyperlink' option can be selected, which allows you to choose to link to another slide. You can then click on 'Place in this document' to view your other slides. This is a good alternative to the action buttons demonstrated above as you can use any image you like for them. If you have a website, you could recycle images and logos from that and put them into your touch screen presentation. You could also get the person who designed your website to design images as buttons for the navigation. As PowerPoint allows you to place images and text anywhere, you can quickly copy a website design. Copying an existing design as a template is easier than starting with a blank white slide and trying to start a design from scratch. 18. Creating a touch screen application with PowerPoint 2010? If you don't have PowerPoint, you can download a trial copy of Microsoft Office Professional 2010 or Office Home and Student 2010, both of which include PowerPoint 2010, from www.microsoft.com and have a go at producing your own touch screen application. PowerPoint will allow you to produce a presentation with buttons on the slides that allow users to navigate between all the slides you create by clicking on large buttons. If you can get PowerPoint to produce your intended application, then you are only looking at £119+VAT for the software, plus you can purchase a 17" touch screen for around £325+VAT. Open PowerPoint which will automatically create a new presentation for you. If it doesn't then select 'File' and 'New' and 'Blank Presentation'. appears down the left hand side of the screen. Now on your keyboard hold down the Ctrl key and the press the S key to save you presentation (Ctrl + S) or select 'File' and 'Save As', and give your presentation a name, such as 'touchscreen' and click 'Save'. On the top toolbar select 'New slide' and a new blank slide appears on the left hand side of the screen, and a larger one in the middle of the screen. Where it says 'Click to add title', type in 'Contact information'. Add another new slide and name this one 'Services'. You will now see three slides down the left hand side, named 'Touch screen application demo', 'Contact Info' and 'Services'. Save your work with Ctrl + S on the keyword. Click on the 'Insert' menu at the top of the screen, then click on the 'Shapes' button and look at the bottom section called 'Action buttons'. Now click on the bottom right button which when you put your mouse over it says 'Action button: custom'. You will see your mouse turn into a + symbol and you need to click your mouse on the slide in the main area to add the button to the slide. Your button will appear on screen and then a box called 'Action settings' will open. On the 'Action on click' section, click on 'Hyperlink to' and in the drop down box select 'Slide�' and select '2. Contact info'. Click okay. Click your new blue button, then right mouse click it to bring up the menu, and click on 'Edit text'. Now type 'Contact us'. When you play the presentation after it is finished, what you're doing is telling the programme to move to the 'Contact Info' slide when you touch (click) the 'Contact Us' button. Then do the same for the third slide and create a Home button hyperlinked to '1. Touch screen application demo'. Pressing the 'Home' button will take you back to the main menu. The program will be full screen and if you only use the mouse (simulating a touch screen kiosk without a keyboard) you will not be able to stop the presentation or do anything else with the computer. Press the Esc key on your keyboard when you have finishing playing with this. You may have noticed that the buttons you have created are not exactly where you want them. You can of course, move them into the position you want them to appear, when you first create them, by clicking with the left mouse and dragging them into position. If you want to add some effects to your page you can click the 'Design' menu on the toolbar to choose a selection of designs. From the 'Transitions' menu on the toolbar you can choose how you want each screen to appear, such as by fading out or reveal. Selecting 'Slide show' then 'From Beginning', you can test each type of transition to get the effect you want. By selecting 'Animations' from the menu on the toolbar you can make your buttons fly-in, appear and other animated effects. You can change the colour of your buttons and text from the 'Format' menu. Notes can be added to your slide show from the 'View' menu, whilst the 'Review' menu has features such as a spell check, thesaurus, etc. The 'Insert' menu lets you add pictures, clip art, table, photo album, charts, video, audio and other features to your slide show. You can also apply timing to your presentation slide show from the 'Slide show' menu. It's worth playing around with all the various menus to get the best from your PowerPoint slide show. Now the final stage is to play your application. You can rehearse your slideshow by selecting 'Slide Show' from the menu toolbar, then click 'Rehearse timings' and a small Recording box appears that times the length of the slideshow. You can 'Broadcast slide show'. This lets you broadcast the slide show to remote viewers who can watch in a web browser. The 'Set Up Slide Show' icon gives you options such as looping continuously until you press 'Esc.' This means your PowerPoint presentation just keeps on going, so when it gets to the end it goes back to the beginning again. You can also display your presentation to multiple monitors which are connected to your computer. Once you have set your preferences, you click 'From beginning' again to start your presentation. To publish your presentation, in the 'File' menu, select 'Save As', and in the 'Save as type' drop down box, save as a PowerPoint Picture Presentation (.pptx). Then test this by downloading the free PowerPoint Viewer from www.microsoft.com (search for PowerPoint Viewer). PowerPoint Viewer lets you view full-featured presentations created in PowerPoint 97 and later versions. This viewer also supports opening pass-word protected Microsoft PowerPoint presentations. You can view and print presentations but you cannot edit them in the PowerPoint viewer. If you want to save your presentation onto a CD or other media, then you do so by selecting 'File' and 'Save & Sent' menu. The demonstration above is very basic. You would need to spend time learning PowerPoint to get the best out of this package. 19. Creating a digital signage presentation with OpenOffice.org 2.3 / 3.2.1.36? This was originally created on the OpenOffice.org 2.3 version, as per the instructions below. It may differ for other versions. For this edition of our digital signage guide, we retested creating a digital signage presentation with OpenOffice.org 3.2.1 version on a Windows 7 computer. We have listed the differences in brackets for you. To create a digital signage presentation with OpenOffice.org you need to visit their website www.openoffice.org and from the icons on the right hand side, select 'Impress'. This will take you to the Impress page where you can view a flash demonstration of Impress. To download a free copy of OpenOffice, which includes Impress, click on the Download tab at the top of their webpage and then click 'Download OpenOffice.org'. OpenOffice is free but you can make a donation if you wish. When you have downloaded the file then please work through this quick guide below, to create a digital signage presentation. Go to 'Start' menu on your computer (bottom left-hand corner), and look in 'All Programs'. You will see an OpenOffice.org folder. Click on 'Impress'. It brings up a wizard that asks you to accept the terms and conditions and enter your details (just the first time it is run). A 'Presentation Wizard' box, screen 1 appears. Check that the default settings of 'Empty Presentation', and 'Preview', are ticked, then 'Next'. Screen 2 appears. Move your cursor to the small slide on the left hand side. Right click and select 'New slide'. A new slide appears which says 'Click to add title'. (OpenOffice.org 3.2.1 users need to Right click and select 'New slide' and another blue slide appears.) On the large blue slide, edit your text, by clicking onto the words. Type in 'Digital signage'. (OpenOffice.org 3.2.1 users, click the 'T' on the bar at the bottom of the page to add text.') You should see two slides in the left hand navigation bar. Save your presentation by selecting the 'File' menu at the top of your screen, and 'Save as'. Save it as 'digitalsignage' The system puts in the extension .odp automatically at the end of the filename. If you wanted to talk through a presentation you can add notes by selecting the 'Notes' tab. Create a handout by selecting the 'Handout' tab, and move your slides around in the order you want them to appear by selecting the 'Slide sorter tab'. However, we want to run a slideshow on a display screen, rather than do a manual presentation to an audience. You can add as many slides as you wish. Before you run your slideshow, you'll want to select how many seconds you want each slide to appear on screen for and which slides you want to view. Go to 'Slide show' on the menu bar. Select 'Slide show settings'. You can opt to show all slides by ticking the 'All slides' box. In the 'Type' section, tick the 'Auto' box and select how many seconds you want each slide to appear on screen, by using the arrows, for example, select 5 seconds. In the 'Options' section you can specify how you want your slides to appear, for example, you can have them changed manually, which is ideal if you are doing a presentation to an audience. However, we don't want to use the manual option, so just ensure that the 'Animations allowed' box is ticked. Click OK.
Go to 'Slideshow' on the menu bar and select 'Slide Transition'. On the right hand side of the screen you can select how you want each slide to appear, for example, 'Wheel Clockwise, one spoke'. Beneath this section, you will see the 'Modify transition' section. Here you can choose the speed you want each slide to change. You can even add a sound if you wish. In the 'Advance slide' section, ensure its clicked on 'Automatically after', then select how many seconds, for example, 5 seconds. This means it automatically changes slides after 5 seconds. Click 'Apply to all slides'. To run your slideshow, select 'Slideshow' in the menu bar, and then 'Slide show' or press F5. This will run your slideshow on your screen. To come out of this and go back to the menu, press Esc. The demonstration above is very basic. To get a presentation to automatically run on the start of Windows then you would need to look in the OpenOffice help system under 'Command line parameters'. You would need to spend time learning OpenOffice.org to get the best out of the Impress package. 20. Creating a digital signage presentation with Windows Movie Maker v.5.1.38? This was originally created on a Windows XP computer using version 5.1 of Windows Movie Maker. It may differ for other versions. For this edition of our digital signage guide, we retested creating a digital signage presentation with Windows Movie Maker on a Windows 7 computer using the 2010 edition, please see the next section in this guide for that version. When you want to display a simple message, such as showing images of new products in a reception area, then Windows Movie Maker may be sufficient without having to buy a digital signage software package with bells-and-whistles features that you may not need nor use. Here is a quick start to using Windows Movie Maker, which is available on most PCs which have Windows operating system. Click on start, go to 'All Programs', scroll through the list to find Windows Movie Maker, then click on it to open the program. Starting with 1. Capture video, click on what you want to import, which could be a video or a picture (image). This opens up a Window. In the 'Look in:' box, change to where you save your pictures (.JPEG, .GIF, BMP, etc.) Select your picture and the name appears in the File name: box. Click import. This brings you picture onto the right hand section titled Collections. It then gives you instructions that you can drag and drop your picture or video onto the storyboard below. Drag your picture into left hand white box in the storyboard (bottom of the screen). To import another picture, click onto 'Import picture's and repeat. You will now see that your second picture is previewed on the right hand side of the screen in the Collections section. Drag and drop your second picture into the second of the white boxes in the storyboard. Let's assume you want the first picture to appear again but this time in the third white box. Simply drag and drop it in. You now have three pictures in there. You can import pictures, audio or music, video or capture from a video device, such as a digital camera. Once you have your content in the storyboard, you can then move onto Step 2, Edit movie. Click the circle at the side of Edit movie and you can see the sub headings: Show collections, View video effects, View video transitions, Make titles or credits, Make an AutoMovie. Click on View video effects. Click onto the first of your pictures in the storyboard, then click onto the effect you want, such as Fade in, From Black. Then drag the 'Fade in, from Black' picture and drop it onto your first picture. In the Movie player at the right hand side of the screen, let's see how this looks. Put your cursor on the first picture in your storyboard, and click the Play button (large button on the left), and you can see the effect on your picture. Go back to the Edit movie section (left hand side of the page), and this time click on View Video Transitions. You will see in the middle of the screen the effects you can choose. Select one, for example, Bars, and drag it into the first small white box on the storyboard (this is the first small rectangle in between your two pictures). Put your cursor on the first picture in your storyboard, and click Play in the player. This time you see your first picture, the bars and then your second picture. In the second of the small white boxes, this time drag down a circle. You should have your first picture, bars, second picture, circle. Now put your cursor on your first picture and select Play. Watch your movie run through. Back to Edit movie menu, and select Make titles or credits. This brings up a menu window which asks you where you want to add your title and credits. We won't be using this, but you now know where it is. Click on Cancel at the bottom of the list. The last choice on the Edit movie menu is AutoMovie which lets you choose an AutoMovie editing style, which has pre-determined ways of running your storyboard. We won't be using this in our example. You could save your movie to your computer and then save to a Flash memory card to be transferred to a dedicated PC which then outputs it to your display screen. As with any Windows programs, you will find help by pressing F1 on your keyboard. Plus there is a Movie Making Tips menu on the main Windows Movie Maker screen. You may want to show pictures or play music for specified periods of time. On the storyboard you will see a Show TimeLine option. When you click on this you can specify how long you want each picture or audio/music or title overlay to play for. You can click back to 'Show Storyboard' and click 'Play' to see the various effects. On the main menu at the top of the screen, there are other editing tools from which you can choose. The quality of the finished movie will depend on the size and quality of the images (always use large, high quality images, not the compressed ones you use on your website) and other content. On the Windows XP version, make sure than when you save your movie with the 'Save to my computer' option, that on the movie settings screen of that wizard, you choose 'High quality video (large)' from the 'Other settings' list. Unfortunately, the maximum resolution is 640x480 pixels. On Windows Vista, Windows Movie Maker has been updated to take account of HD video formats that really allows you to produce professional looking movies. 21. Creating a digital signage presentation with Windows Live Movie Maker 2010? For this edition of our digital signage guide, we have created a digital signage presentation with Windows Live Movie Maker on a Windows 7 computer using the 2010 edition v. 2011. Click on start, go to All Programs, scroll through the list to find Windows Movie Maker, then click on it to open the program. The screen looks different to the previous version. On the toolbar at the top of the screen, select 'Add videos and photos'. This lets you browse your computer for images and videos. Select an image and it appears in the left hand box. A thumbnail of the image appears on the right hand side of the screen. Repeat and add another image. Now you can see two thumbnails on the right hand side of the screen. If you want to delete an image, just click on the thumbnail and press the 'Delete' key. You save your work by clicking on 'File' and 'Save as', and then giving it a file name. You can select the Webcam Video icon and set it recording. When you stop the recording it saves it as a .wmv file. The default name is Capture 1 (date).wmv You can rename it. I discovered that you then had to close the program down and reopen it again. You can then add your video by selecting 'Add videos and photos'. Once you have brought in as many pictures and videos as you want in your movie presentation, click the 'Animations' tab. You can select an icon, such as an X, and you will see your first image fades out into an X, revealing your second image, and so on. Selecting the 'Visual Effects' tab allows you to have brighten images or fade them. Selecting 'Project' allows you to play your movie presentation in standard 4:3 aspect ratio (shape of an old TV), or widescreen 16:9. You can also fit your presentation to music or set music to play and video to play at the same volume or one louder than the other, all from this same 'Project' menu. You can edit your movie presentation, adjusting the speed in which it is played, give it a background colour and add a title and credits. There is a play, forward, backward, stop and pause control beneath the image box on the left of the screen, where you can preview your movie presentation. When you are happy with it, click 'Save movie' from the menu bar. This saves it to your computer as a .wmv file. It then gives you a message that you can now play your movie or open the folder its been saved in. Clicking on 'Play', it opens out full screen and plays your movie. (resolution) you need your presentation to be for uploading. It recommends that if publishing to one of these websites fails, then to retry publishing at a smaller size. For example, 1920x1080 True HD, my example movie was 25.57MB, but if I publish at 1280x720 HD Ready, then the size of my movie reduces to 11.48MB. The above is a basic demonstration. You need to take time to learn the software to get the best from it, but this demonstration does give you an insight into what you can do, before making any decisions as to your digital signage requirements.